You can retrieve databases in your mysql server using php. On mysql server, you can use mysql query in order to get databases in mysql. The following mysql query is used to display database list. You can display database list in mysql using php in two ways. All of you know, create mysql database in phpmyadmin. Now we are going to know how to create database using php. - mysql_connect() is used to connect the database. - 'localhost' is server name. - 'root' is user name of database. - '' represent the password of database. - mysql_query() is used for execute the mysql query. - 'new' is the database new. - mysql_error() give error message while the mysql query is execute. - die() terminate the excution. Now you'll get output as " Database is created ". Then you can see the new database in your phpmyadmin. The database 'new' is created and ready for use. All of you know, you can copy data within a table and between tables. But can you copy data between two database in mysql. Yes, you can done it in mysql. The following mysql query is used for do this. Consider following example. You've two databases named with db1 and db2. Each database have a table. Table1 is presented in db1 and Table2 is present in db2. Now you'll get values in Table2 as like as Table1 in db. You can copy the values from one database to another using this method only if two databases are in same server. 1.You have to login to your cpanel to create mysql database. 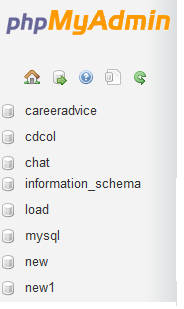 2.Then you need to select mysql databases. 3.Type your database name. Then click create database button. Here, my database name is 'new'. 4.Then you have to create new user. Type your user name here. 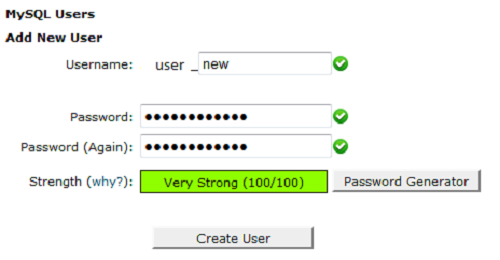 Then click password generator to get password for your user name in mysql. The pop up box is opened as follows as. Select the checked box and click use password button. Then you the strength password is loaded. Then click create user button. Now the user name is created. 5. Then you need to add your user name to mysql database. Select your user name and database as follows as. then click Add button. 6. Now you select all the privileges. Then click Make changes button. Now you created a mysql database , user in cpanel and add user to mysql database. Then you back to home and click phpmyadmin. 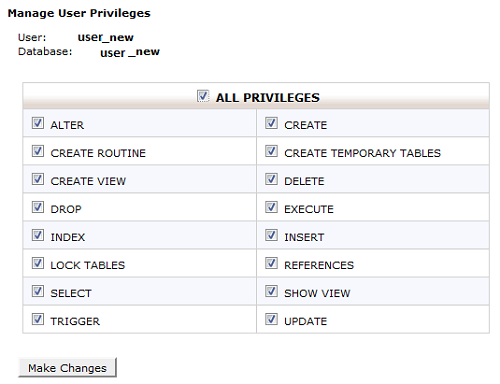 Then you can create table in your mysql database.